D. Bryant Simmons has already made an appearance at Grab the Lapels when she answered my questions for the Meet the Writer series, and I am pleased to be able to review her book, How to Knock a Bravebird from Her Perch, which is the first in what is called the Morrow Girls series. D’s second book in the series, Blue Sky, was recently released, so if you like this review and read the book, the second one is available! How to Knock a Bravebird from Her Perch is set mostly in the 1970s and is about Belinda (“Pecan”), a girl with a daddy who raised her right and loved her so, but when a Ricky comes into her town, things get messy. Pecan’s daddy doesn’t really seem to like Ricky, but he can’t say too much about it, as he has a heart attack and dies within the first few pages. Ricky and Pecan get married and move to Chicago where Ricky trains as a boxer and Pecan starts having babies. Girl after girl is born, and Ricky really wants a boy. He appears to hold this against Pecan, but that’s not surprising; Ricky has a temper on him and fists trained to hit. For several years, Ricky’s Aunt Clara lives with the family, and she is often able to keep Ricky from knocking the crap out of Pecan by threatening him with a cast iron skillet. But one night, when Pecan goes dancing with her girlfriends after Aunt Clara tells her she has to, Pecan meets an honorable man. It’s not 100% clear to me what would be considered a spoiler, so I’ll stop there. There are two distinct aspects of this novel that stand out: the way Simmons challenges the reader to face their preconceived notions about domestic abuse, and the pacing. That’s all I could get out before he hit me again. And again. And again. I just couldn’t believe it. Not me. Other girls might have that happen to them but not me. My man was not doing that to me. There are a series of thoughts that I had as a reader that made me feel horrible, and I believe Simmons was doing this to me on purpose. First, I paid attention to why Ricky hit Pecan the first time. Shortly after their first baby is born, Pecan packs up the baby and as much food as she can carry and tries to run away. She says that she has been lying to him to tell him what he wants to hear, but if I think back on the timeline, they haven’t been together that long. Why did she marry the first guy to talk to her, I ask, if she’s just going to lie to him? When I think about Ricky finding Pecan standing on the sidewalk with his baby and her guilt, I realize that I would be mad, too. Then comes the hitting. It’s that moment that Simmons makes readers tie together poor logic: Pecan was being a horrible person, and Ricky was just reacting. Of course, people make these logical leaps in the real world all the time. We excuse the hitters and blame the victims–and are quick to do so. When Pecan spends years and years and years getting hit by Ricky, readers are forced to wonder why she doesn’t call the police. Why she doesn’t try to run away again. Why she doesn’t ask for help. We think, Oh, she’s probably thinking he doesn’t hit the kids, so it’s okay, but once he does she’ll leave (how stupid; of course he’ll eventually hit the kids). This is where we must all stop; why are we asking questions of what Pecan does and doesn’t do and not of what Ricky does? This is one of the triumph’s of Simmons’s novel: she makes readers go to these uncomfortable places and face their own judgments. The pacing becomes very important to making the novel realistic. The children growing are great time indicators, and part of their growth is not just age, but in cognitive function. They begin to realize what’s going on, to speak to their mother differently than their father, to realize what makes them afraid. Watching the four daughters grow into their personalities gives the book a slow, steady pace that demonstrates just how long the domestic abuse goes on. We don’t need to read about every punch and every cut, black eye, and broken bone (I remember reading these details in Roddy Doyle’s The Woman Who Walked Into Doors and feeling sick over and over) because there are other ways Simmons shows how time progresses. When child protective services gets involved, it seems like the whole CPS agent/home visits is a waste of time to the point where I felt myself getting angry with an agency designed to help children be with their parents and be properly cared for. It feels like Pecan will never be with her family and happy and unafraid because someone will always be a barrier. Took my time going down the stairs. One step at a time. Holding onto the banister and the wall. Had to come up with new reasons to get outta bed every night. Wasn’t no sense in having both of us worry. I flicked on the lights and checked each window on the main floor. Had to wait until bedtime because Heziah was in the habit of opening a window every time he went into a room, but most of the time he forgot to close and lock it. Wasn’t his fault. He just ain’t know like I did. I knew better than to leave anything open or unlocked. We’d gotten the locks changed, but Ricky Morrow wasn’t the type to let a locked door stop him. And it is this slow pacing that gives the book its realistic feel; separation, violence, legal issues, and parents’ rights are not easy topics to summarize and stuff in the closet. It’s a long, drawn-out process that affects so many individuals, and Simmons captures that reality in her book. 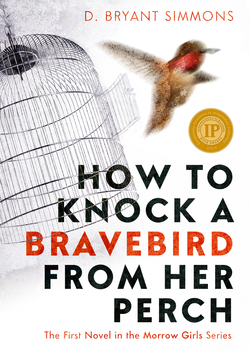 Overall, How to Knock a Bravebird from Her Perch is novel that is able to capture many characters and render them in a realistic tone that makes it pleasurable to read in addition to the challenging topics readers will face. I can’t read books where abuse or cheating are in the forefront, because I ask myself similar questions and begin to get too frustrated! More power to you! Abuse is such a heavy theme. I have read two titles this year that feature domestic abuse. This sounds like a tough read although an important one too. Thanks for letting me know about the book. I will add it to my TBR. The publisher would be very happy to have you review her books, I’m sure. If you contact her, she’ll send reviewer copies.